Long time before, almost a century ago, 8x30 binoculars of Porro prism design had already reached quite a reasonable performance level. This was so because 8x30 was about to establish itself as one of the standard sizes in military applications, at least in Europe, and there has always been plenty of money available for war toys at any times. 8x30 binoculars are compact, lightweight and fairly powerful. No surprise that these devices had quickly been accepted on the civilian market as well in rather peaceful times. 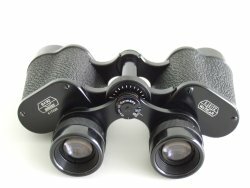 In this review, I will present a small, and in no way exhaustive, selection of these classic binoculars, covering both military and civilian samples. Despite of being made after WWII, some of them carry a heritage which reaches back well before the 1950s. For comparison, I refer to earlier reviews of German military 8x30 binoculars, European military 8x30 binoculars, and high performance 8x30 Porro binoculars. The Zeiss Jena Deltrentis was no doubt the mother of most classic 8x30 Porro binoculars. On the list of Zeiss binoculars, this item is first showing up in 1920, along with the center focus version called Deltrintem. At that time, the body was made of magnesium and of featherlight 390 g. The wideangle eyepieces were designed by Albert Koenig, were free of distortion and contained 4 lens-elements. A single layer anti-reflection coating with a bluish color was first added during WWII. According to Albrecht Koehler, this ocular was replaced in 1947 by an Erfle design with 5 lens-elements and a certain amount of pincushion distortion in order to eliminate the globe effect. In 1978, the amber colored multi layer coating was introduced, and around 1990, when Docter took over the old Zeiss plant in Eisfeld, another improved coating of greenish color was used. 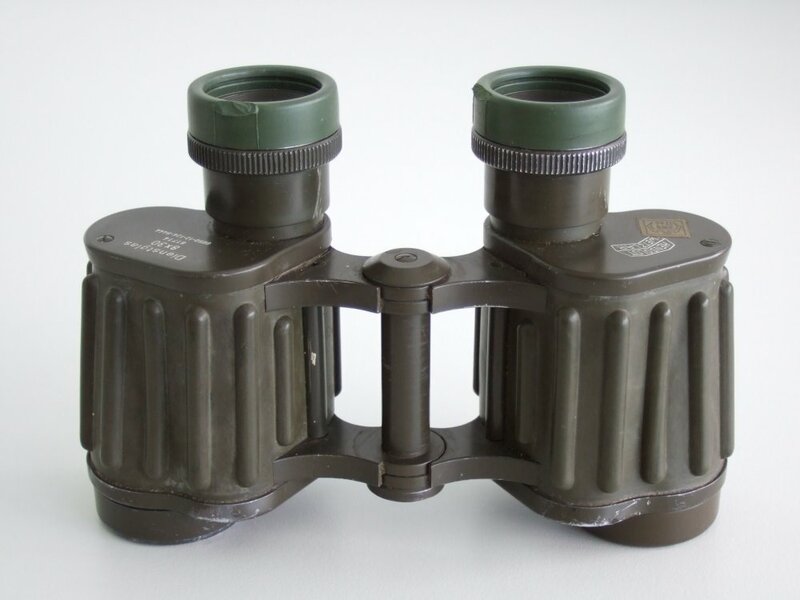 The production of this binocular was halted around 1995. The civilian, center focus version was also called Jenoptem during the 1980s. The sample on Fig. 1 was not made for the regular army 'NVA', but for the ministry for internal affairs, which covered paramilitary law enforcement units - hence the imprint 'MdI' (Ministerium des Innern). Perhaps no other binocular in history has been cloned as often as the Deltrentis or the Deltrintem. Millions of original Zeiss Jena 8x30 were made, and even more copies have been produced in various countries, for their military, but also for the civilian market where they were sold under countless brand names. Two of those clones are also subject of the present review. Fig. 2: The Bulgarian military B8x30 (serial no. 220064, probably made around 1980). Right: The list of items inside the case. In 1945 the Soviets disassembled the Zeiss Jena plant and transferred machines and also selected engineers to the East as a part of their war time reparations. It is generally believed that the blueprints of many Zeiss Jena products were taken over without any major modifications, yielding quite a decent lot of optical products made in USSR, including binoculars and camera lenses, among others. 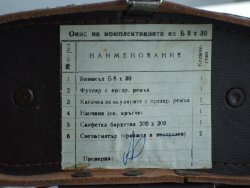 This B8x30 was sold to me as a "Soviet military binocular", but in fact the factory logo has been identified by Per Beckman as belonging to the Bulgarian factory OMZ (OPTICAL AND MECHANICAL WORKS - Sofia). Most likely, it is a Zeiss Deltrentis clone as well and it may also be based on the same blueprints as the Soviet made clones. Before the mid 1930s, the Chinese army imported their optics mostly from Germany and also from US, but by 1940, China had already established their own optical industry. This military 62-8WYJ is often called 'type-62', since it was first designed in 1962 as a clone of the Soviet 8x30 binocular. It was actually in service from the 1960s until the end of the 1990s, when it got replaced with the 7x40 GG95 which is currently the standard binocular of the PLA (Peoples Liberation Army). 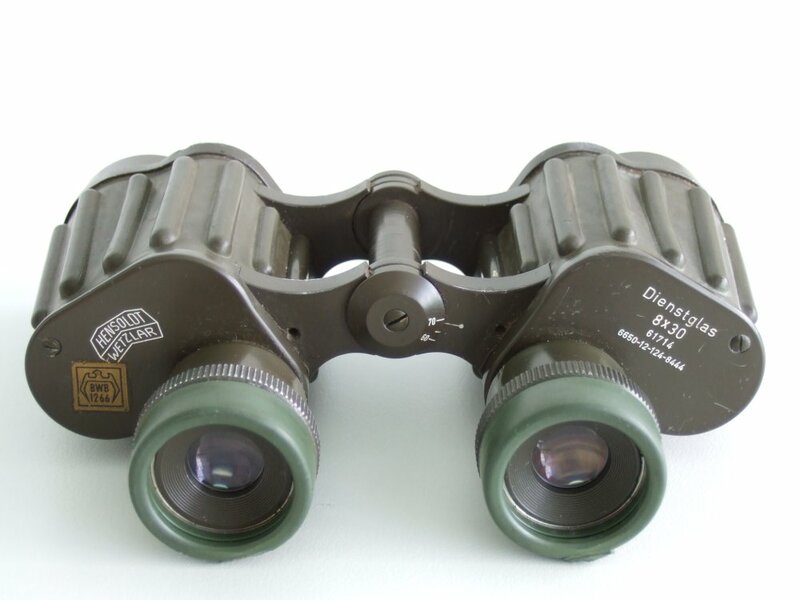 Last true military models were made in mid 1980s, but this binocular is still in production at several factories (the factory code is the encircled number, here '98'), like the current model in Fig. 3, and samples from different factories may vary in certain details. This binocular is also employed in several third world countries. As an interesting gadget, it has got exchangeable silica gel cartridges built into either tube to keep them dry inside - a very useful feature when in excessive use under humid weather conditions. The prism house covers extend about 1cm down the body which may have a favorable impact on water resistance. The body is a little bit higher when compared with the Deltrentis or the Bulgarian B8x30. Therefore, this currently made sample may be a copy, but surely not any more an exact clone. After WWII, a part of the former Zeiss Jena staff moved from the Soviet occupied East Germany to the West, where shortly thereafter the "Zeiss-Opton Optische Werkstaette Oberkochen GmbH" (in short: "Zeiss, West" or "Zeiss Oberkochen") was inaugurated. 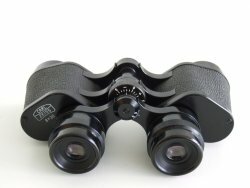 Binocular construction began from scratch, and the first output was this 8x30 which was ready by 1954. The civilian version of Fig. 4 was with center focus, as usual, and the military version was with individual focuser for its superior water sealing (the military version, available from 1957 to 1964, was reviewed here). 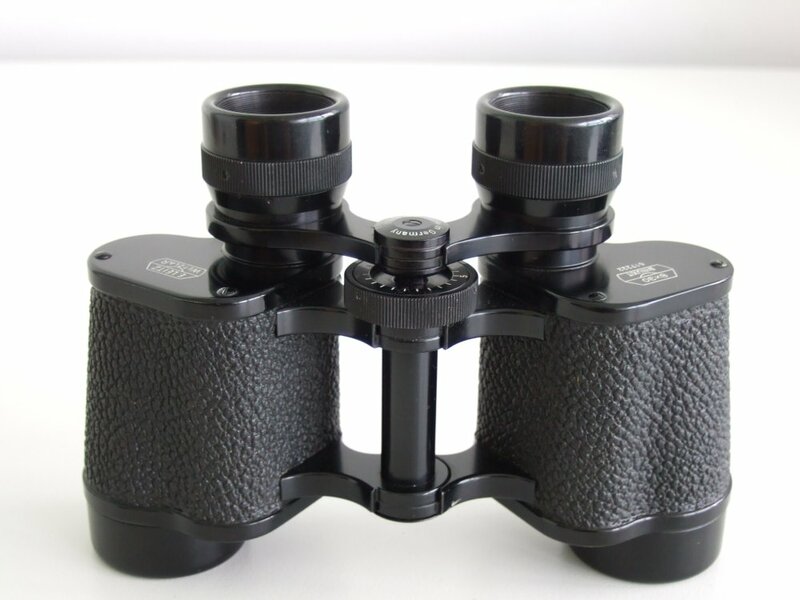 This binocular came with an air spaced (tele-) objective which allowed for a short and very compact body, and a high performance wide angle eyepiece with no less than six lens elements, designed by Horst Koehler. No doubt the Zeiss engineers were eager to set new standards of modern Porro binocular design, and when presenting this new line (which also included an 8x50 and 10x50 model), they did not only send a message to Jena but also to its arch rival, Ernst Leitz. Leitz did not attempt to answer with another improved line of Porro binoculars, but exclusively focused on the development of their roof-prism line. 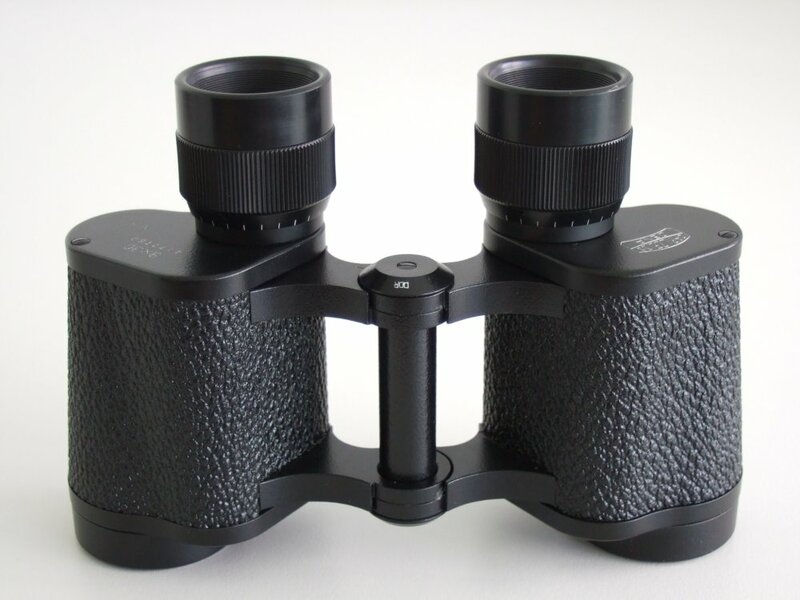 With the Porro design gradually running out of fashion, neither of the both Zeiss factories did ever design any new 8x30 Porro after 1960, but instead introduced their 8x32 Dialyt (Oberkochen) and later on the Notarem (Jena) roof prism binoculars. Since the eye relief of their binocular was very short, Zeiss offered, starting from 1958, a 8x30B version with long 19mm eye relief but narrow apparent field of view around 50 degs., which was in 1968 extended to 60 degs. The 8x30 remained in production until 1971, and the 8x30B stayed around until 1978. The Leitz Binuxit was introduced as early as 1927 and remained in production until 1962, when it was replaced with the 8x32 Trinovid roof prism. During war times, light weight versions were available for the military. War production stopped around serial no. 477... so that the sample on the picture was probably made sometimes during the 1950s. Its external appearance definitely resembles the Zeiss Deltrintem, but it is of entirely independent optical design. The lenses have got the typical single layer coating of that generation, but it appears that the prisms remained uncoated. 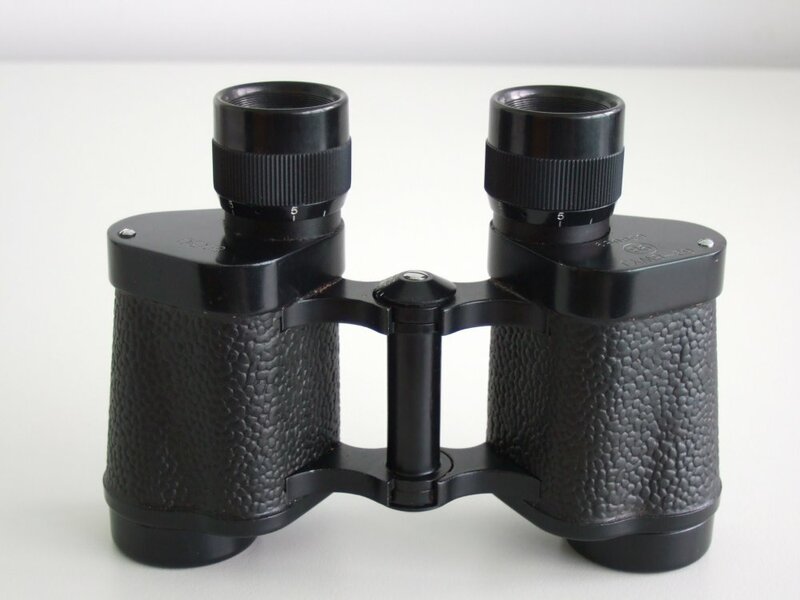 This binocular is the oldest among the seven competitors, but despite of its age it is still in excellent condition, both mechanically and optically - surely a demonstration of Leitz's high quality production standards. 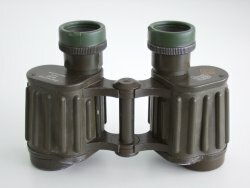 The Hensoldt Diagon was introduced in 1948, it was the center focusing civilian version of the 8x30 binocular which would later become the standard binocular of the German army (Bundeswehr). The military version, the 8x30 DF with individual eyepiece focuser and a partial rubber armor, was introduced in 1955, and by 1960 the full rubber armor was available. The device in this picture belongs to the latter series, I have removed parts of the rubber so that the imprints on the prism house become readable. It is not immediately clear why this binocular had been chosen for the army, since alternatives were available in 1955. First of all, Hensoldt had already collected much experience with their Dialyt roof-prism series, during and even before the war times. Then, Zeiss had just finished the construction of its superb Porro binocular (Fig. 4) which had got the advantage of being more compact and of superior optical design. I presume it was a matter of cost saving, since Zeiss had surely charged a bundle of money for their glass, more than Hensoldt did for its Diagon. Additionally, by 1955 Hensoldt could already offer 7x50 and 10x50 versions of its Diagon, which were also adopted by the Bundeswehr, while the corresponding Zeiss binoculars were still under construction. The 8x30 DF remained in service until the 1970s when they were gradually supplemented (though not completely replaced) with the cheaper but also inferior Steiner models. Since 1986, Hensoldt is again supplying binoculars to the armed forces. The Fero-D 16 is currently issued to the Bundeswehr, along with the 7x50 Fero-D 18 and the 10x50 Fero-D 19. Though not being a classic binocular, it is an interesting addition to the lot of glasses compared here, because it demonstrates the progress that has been achieved in optical engineering during recent decades. Among new features, not offered by any of the other contenders, are (almost) eye-glass friendly oculars with 14.5mm eye-relief, an improved multi layer coating, and a dry nitrogen filling which prevents internal corrosion and condensation. 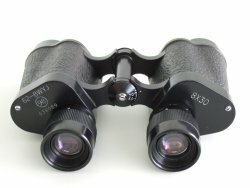 On the down side, its field of view is comparably small, and the Fero-D 16 is the only non-wideangle binocular in this review. Most likely this compromise was necessary in order to increase eye-relief, but cost saving may have been an additional factor when this device was designed. In most cases, the Fero-D 16 comes with built in laser protection filters. As I have already mentioned in another review of this binocular, this filter has got a negative impact on image brightness and color rendition. The sample on Fig. 7 has got its laser filters and rangefinder reticle removed, with positive effects on image quality. The following table is summarizing the specifications of the contenders. Angle of view: Officially, all binoculars except the Fero-D 16 are specified with a large 8.5 deg. field, but in real life there are differences, which might arise due to their short eye-relief and the particular eye-cup design. A good test is the Big Dipper, because the two stars at the bottom of the constellation are 7.9 degs. apart. Those do not fit into the field of the Fero-D 16, as expected. Using the Hensoldt DF, they just barely fit inside, with a minimum space left over - the field cannot be larger than about 8 (or at most 8.1) degs. The Deltrentis, 8WYJ, B8x30 and Leitz show a little more field, I would estimate 8.3 degs. Only the Zeiss Oberkochen is wider, and it seems here the 8.5 degs. are actually reached. It is interesting to note that the Zeiss 8x30 military which I had tested earlier did only have around 8.0 degs., and this implies that Zeiss must have implemented some modifications in between (the Zeiss shown in Fig. 4 is of later production). Image sharpness: At the center, all of the contenders have got an excellent resolution. They essentially differ as soon as the edge of the field is approached. The Deltrentis and its derivates, i.e. the OMZ B8x30 and the Chinese 8WYJ, show point-like stars within about 50-60% of the field (measured radially from the center). After that, the star image is gradually degrading and becoming very poor while approaching the edge. 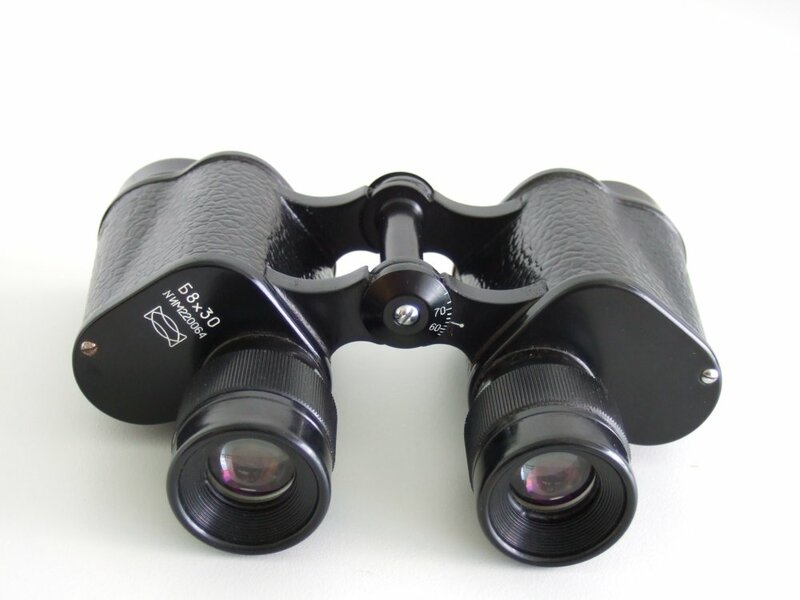 Since this behavior is quite similar among these three binoculars, it is possible that they in fact share the same ocular design. The Leitz Binuxit displays nice point-like stars in the center, and the image is visibly degrading beyond 70% of the field. Both Hensoldt behave almost the same, but one has to consider that the Fero-D 16 has got the smallest field of view so that, in absolute numbers, its field performance is not so good. The best overall image is offered by the Zeiss Oberkochen: Beyond 70%, the stars are not point-like any more, but the image quality is degrading slowly so that near the edge the Zeiss has got the best imaging among all contenders. This is a remarkable result, considering the fact that this binocular is offering the widest field of view. Image color: Both Hensoldt glasses appear neutral, and the Leitz Binuxit comes next with a slight yellowish tint. The Deltrentis, 8WYJ and Zeiss Oberkochen have already got a somewhat yellow image, but not yet strong enough to disturb color fidelity on a significant level. Only the Bulgarian B8x30 has got a strong yellow color, just like most of the Soviet binoculars which I have seen. Rectilinear distortion: Before 1945, binoculars were constructed almost free of distortion, but later it became clear that a certain amount of pincushion distortion would be useful to compensate for the globe effect which has a negative impact on the image of the panning binocular. In fact, all of the contenders in this review display such a pincushion distortion. 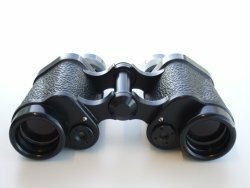 Stray light: A good suppression of stray light is an important feature of binoculars which are used in difficult light conditions. Stray light baffles behind the objective are useful as well as aperture stops near the prism entrance, an anti reflection painting of the inner tube walls, well covered prism bodies and lens edges which are sealed with black paint. Inside an 8x30 binocular, however, there is not too much space available for all these installations, and therefore it is often the case that 8x30 binoculars are more prone to stray light than, for example, the larger 7x40 binoculars. The B8x30 is suffering a lot of stray light and this is affecting the image contrast even under rather normal light conditions. The Deltrentis is not much better: It has got an additional baffled tube behind the objective, but one with a rather glossy surface so that stray light is abundant. The 8WYJ is already somewhat better. Compared with the Deltrentis, the optical tubes reach a little longer beyond the objective lenses to form a 1cm deep lens hood. This simple modification improves the stray light resistance at the cost of longer tubes. But under really difficult light conditions, especially after sunset, the 8WYJ is suffering as well. Next comes the Binuxit which has already got a reasonably good over all stray light resistance. The Hensoldt DF is even better and here it becomes difficult to generate any significant loss of contrast, because whatever stray light is produced, it remains located near the edge of the field and does usually not affect the central regions. Almost perfect are the Fero-D 16 and the Zeiss Oberkochen, both having a most effective stray light protection. These binoculars can be used under any light conditions without significant loss of contrast. Ghost images: If, at night, a bright object (street lantern, moon) is positioned into the field, reflections on the air-to-glass surfaces take place, which can lead to multiple 'ghost' images of the light source. A good anti reflective coating on lenses and prisms is the most effective way to prevent these ghost images. No surprise, the Fero-D 16, being among the younger generation of binoculars considered here, delivers the best results. Its coating is of decent quality, though not perfect, of the performance level of the early 1990s as expected. The Zeiss comes in second, followed by the Hensoldt DF. It seems that this Zeiss model is of somewhat later production date and equipped with the most efficient single layer coating of that time. The Chinese 8WJY, the Leitz Binuxit and the B8x30 come next, they already produce a significant amount and intensity of ghost images whenever a bright light source is observed in the night. This indicates that the 8WJY has got a single layer and not a multi layer coating (the multi-coating was first applied to binoculars by Zeiss in 1978). Finally, the Deltrentis comes last, its ghost images display the highest intensity among all competitors. This is a little surprising to me, because it was made in 1973, much later than the Zeiss Oberkochen or the Leitz Binuxit. By 1973, superior coatings were available, but the Deltrentis does not perform accordingly. Upon closer inspection I am convinced that the prisms of this binocular are without any coating, and this could explain its rather poor performance in this test. 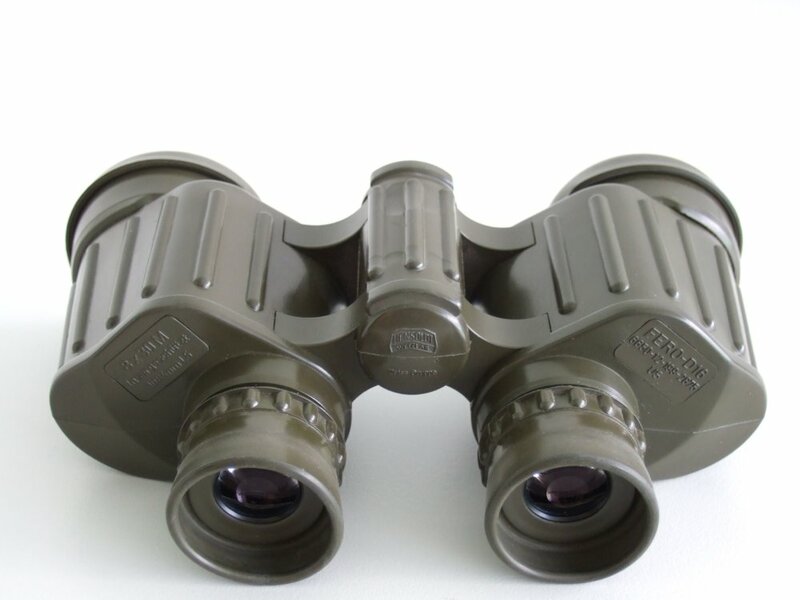 Low light performance: Obviously, 8x30 binoculars can never be specialists for low light application, but in military service the situation may well arise that observations have to be carried out under dim light. Here, the Fero-D 16 clearly displays the brightest image. 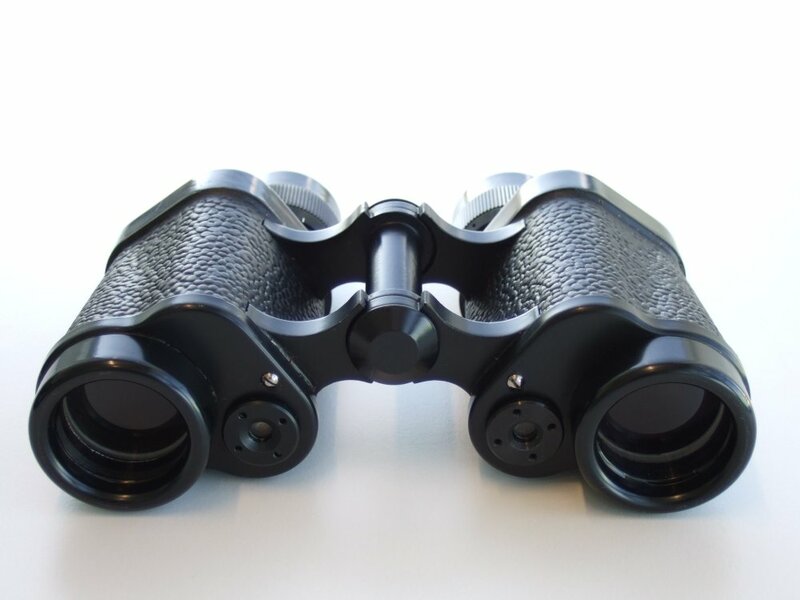 All other binoculars are rather close. First of all, their exit pupils have been verified to be of correct size, which is specified as 3.75mm as it should be with any 8x30. All of them have got a single layer coating which should, give or take a few %, deliver a similar rate of light transmission. The Hensoldt DF and the Zeiss Oberkochen deliver a similarly bright image during the twilight after sunset. Just a little bit dimmer are the Leitz Binuxit and the 8WYJ, and the Deltrentis is again a tiny amount darker. Last comes the B8x30, but, once again, the differences between all binoculars, except the Fero-D 16, are subtle and not easily visible on the first sight. As a matter of fact, none of these binoculars is of poor mechanical construction. The Leitz and the Zeiss do already exist since several decades but they are still perfectly functioning. 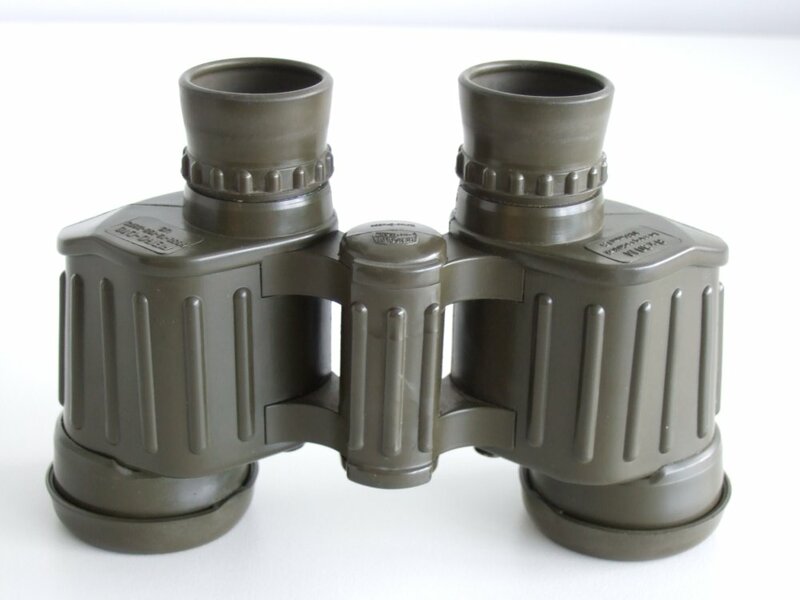 All other binoculars were made for military use and naturally of very solid construction. The individually focusing models are water resistant, which concerns all samples except the Zeiss Oberkochen and the Leitz Binuxit. Both Hensoldts have got the rubber armor which can serve as an additional protection against impact. The 8WYJ has got silica gel cartridges which further improve the water resistance and life time of this device. 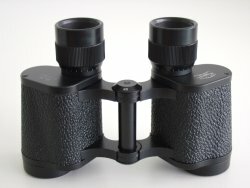 Probably, the best set of features comes along with the Fero-D 16, which in addition to its rubber armor is filled with nitrogen and which can fairly comfortably be used with eye-glasses on, features which make this glass unique among the seven competitors. The following table is supposed to summarize the above observations. The points are distributed according to their relative rankings, so that the best binocular gets 7 points, the second one 6 points and so on. In case two or more items occupy the same rank, their scores are averaged so that each discipline retains a total weight of 7+6+5+4+3+2+1=28. The 'final score' is the sum of the individual scores and is intended to serve as an orientation only. This field of competitors can clearly be divided into two subsets: There is a group of high performance binoculars, both Hensoldt among them and the Zeiss Oberkochen, and a second group, separated from the first by a significant margin, which has got certain shortcomings. The leading position of the Fero-D 16 is no surprise because it is a currently issued binocular, designed with state of the art technology. Therefore, it should be regarded outside competition here, not really being a classic. The removal of its laser filters has led to a significant performance boost. The present sample would reach much closer to (although not arriving at) the performance level of the Fujinon FMTR-SX discussed in an earlier review, which also contained the same Fero-D 16, but with laser filter installed. 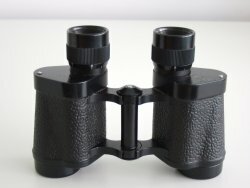 This binocular is not yet perfect, however: Its field of view is rather narrow and comes with a mediocre edge sharpness. This fact can only be explained with the employment of a set of simple oculars, and in this way Hensoldt has missed an opportunity to create another memorable high performance binocular. The performance of the Zeiss Oberkochen was a positive surprise. In a couple of disciplines, this sample was superior to the military version which I had tested earlier. To be fair, that military binocular had been heavily used and plenty of cleaning marks and a slight amount of haze on the prisms may have had some influence on its performance. But there have also been improvements on the design itself, the field of view of the civilian version tested here was a little wider than the one of the military version. 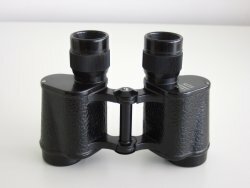 Also, lens coating technique has improved continuously, and it is likely that the present binocular took profit of a later generation coating. In summary, this is an almost perfect 8x30 binocular, apart from its short eye-relief and its non-waterproof body. If equipped with a modern multi-coating, this glass could actually compete with my favorite 8x30, the Nikon EII. The Hensoldt DF is on a similar level as the Zeiss. Being somewhat inferior in its optical performance, it has an advantage with its rugged construction. In any way this DF is a very solid and reliable performer, without any significant weakness. I dislike the attached rubber ocular and objective covers which usually come with the fully armored version and I do suggest to cut them off as an act of mercy to the user. Among a couple of other aspects, this review has proven two points: First, the Leitz Binuxit was superior to its Zeiss competition from 1927 onwards, the year of its introduction, until 1954, the year when Zeiss Oberkochen introduced its new binocular. It also proves that the engineers of that period were well aware of the competition and their performance levels, and always eager to strive for improvements. This old Binuxit of the 1950s was beating its competitors of the 1970s (Deltrentis), 1980s (B8x30) and the currently made 8WYJ, not a bad result for such a grandpa model. Again, if equipped with a modern multi-coating, this binocular were still able to compete on todays medium range market. Among the Zeiss Deltrentis and its clones, the Chinese 8WYJ was the strongest. It may be of the same heritage as the Bulgarian B8x30, which in turn may be a copy of the Deltrentis, but there are a couple of improvements which make the 8WYJ superior to its ancestors. The stray light protection is somewhat improved, the coating is probably superior, and a few mechanical refinements have been implemented. 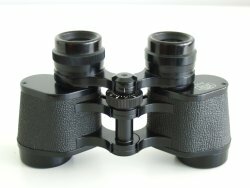 However, this binocular does not have multi-coating, or, in case it does, then a rather inefficient one which is no better than a good single coating. One might argue that the Chinese engineers should rather have copied the Hensoldt or the Zeiss Oberkochen instead. In fact, there exists a much superior Chinese 8x30 binocular, the Xian Vision Ares, presumably a Fujinon FMTR-SX copy, which would no doubt be able to compete head to head with the Fero-D 16. The performance of the Deltrentis may appear a little disappointing. I was surprised to experience the mediocre quality of its coating, which seems to be entirely missing on the prisms. Another fundamental flaw of this design, and this includes also the later versions of the 8x30 Deltrintem and Jenoptem, is its sensitivity to stray light. I have no clue how the crowd of gifted engineers at Zeiss Jena could tolerate such an amount of stray light even in ordinary day light use. Other binoculars of the same factory, like the 10x50 Dekarem/Jenoptem or the 7x50 Binoctem/Jenoptem, do not display any such problem. In any way, I strongly suggest to everybody who wants to buy a Deltrintem to go for the later multi-coated version (serial no. beyond about 4.8 Million, after 1978) which is significantly better. If somebody needs a cheap and water resistant 8x30, he should not choose the Deltrentis but instead look out for a Hensoldt DF which is available for about the same price. The Bulgarian B8x30 was lacking behind, mostly because of its strong yellow image color and a related reduction of light transmission. The present sample is in rather decent condition, externally, since it had never been used before. However, it has past a few decades of storage and was not treated well during that time, which led to a slight amount of haze on its prisms (only visible with a flashlight). I cannot exclude that this circumstance might have had a certain negative impact on its performance, and a freshly cleaned sample of this binocular would possibly have been competitive with the Deltrentis. Its coating is apparently superior to the Zeiss Jena glass. Since it is cheap, this B8x30 is still offering a reasonable deal. 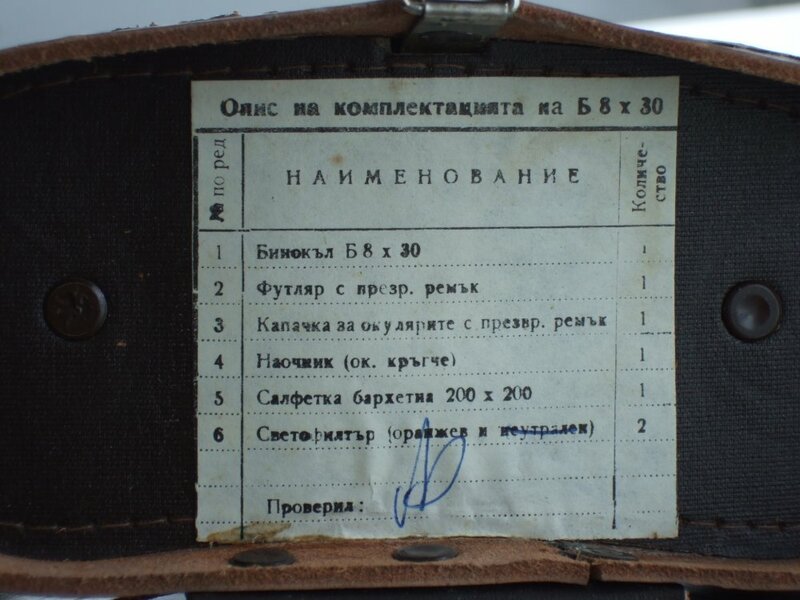 I have also seen very similar Soviet made binoculars, various versions of the BPC 8x30 made at KOMZ and with center focus, which were available for 30 Euro and less, and perhaps of identical optical construction and merits as the OMZ made Bulgarian glass. But one has to be aware that their performance levels remain limited, a natural consequence of carrying the heritage of a 90 year old binocular design. The information given in this report reflects the personal impression and opinion of the author only. I cannot guarantee for the accuracy of any given specification. I have neither been payed nor have I been supported in any other way to write this review. OMZ, producer of the Bulgarian B8x30. Thanks to Per Backman who found this link!